when their voices are still a glory in my ears? No, and I will stand to say no, and no again. For they remain a living truth within my mind. • The Lost Patrol: Mackay and Cook (Brandon Hurst and Alan Hale) set off across the desert to bring help; in longshot they disappear, the sands seeming to ripple in the moonlight, until a shadow engulfs all…. My Darling Clementine (Criterion, Blu-ray, DVD), John Ford’s sublime reinterpretation of the Wyatt Earp story and the Gunfight at OK Corral, rewrites history to become a mythic frontier legend and one of the most classically perfect westerns ever made. Henry Fonda plays a hard, serious Wyatt Earp leading a cattle drive west with his brothers when a stopover in the wild town of Tombstone ends in the murder of his youngest brother. 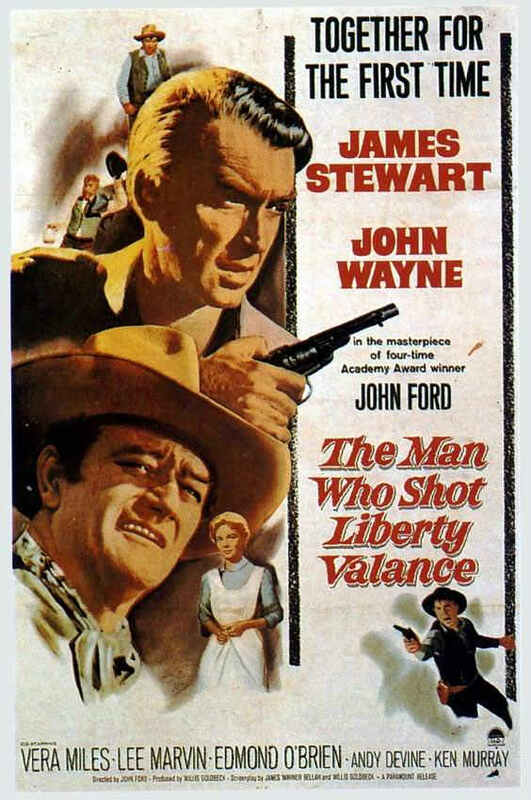 Wyatt takes up the badge he had turned down earlier and tames the wide open town with his brothers (Ward Bond and Tim Holt), waiting for the barbarous Clanton clan, led by a ruthless Walter Brennan (“When you pull a gun, kill a man!” is his motto), to give him an excuse to take them down. Victor Mature delivers perhaps his finest performance as gambler Doc Holliday, an alcoholic Eastern doctor escaping civilization in the Wild West and slowly coughing his life away from tuberculosis. Ford takes great liberties with history, bending the story to fit his ideal of the west, a balance of social law and pioneer spirit. Though the film reaches its climax in the legendary gunfight between the Earps (with Doc Holliday) and the Clantons, the most powerful moment is the moving Sunday morning church social played out on the floor of the unfinished church. As Earp dances with Clementine (Cathy Downs), Fonda’s stiff, self-conscious movements showing a man unaccustomed to such social interaction, Ford’s camera frames them against the open sky: the town and the wilderness merge into the new Eden of the west for a brief moment. It’s a lyrical ode to the taming of the west when manifest destiny was an unambiguous rallying cry. Ford’s subsequent westerns became less idealistic. Along with the 97-minute release version, Criterion has included a new HD transfer of the 103-minute pre-release version (which was also on the earlier DVD), which features footage cut from the release version as well as alternate scenes and other minor differences (such as alternate musical cues). The differences are illustrative of the differences between Ford’s artistry and love of communal atmosphere and 20th Century Fox boss Darryl Zanuck’s efficiency. Ford’s preview cut (which is not a director’s cut) is more open and lanky, always responsive to the community around him, and quieter (he resists burying scenes in orchestral scoring). The release version is tighter, more dramatically pointed, scored more emphatically, and features new shots inserted into Ford’s scenes. It’s a companion, not a replacement, for as we may mourn the loss of Ford’s sensitive and subtle moments, the release version is still the Ford masterpiece. It just got some help from Zanuck, who pared Ford’s loving background to strengthen the characters at the core. My Darling Clementine has been released in multiple editions on DVD by Fox. Criterion has created a new 4K digital master from the 35mm nitrate composite fine-grain held by the Museum of Modern Art for the Blu-ray debut and DVD upgrade. The previous DVD edition looked very good. 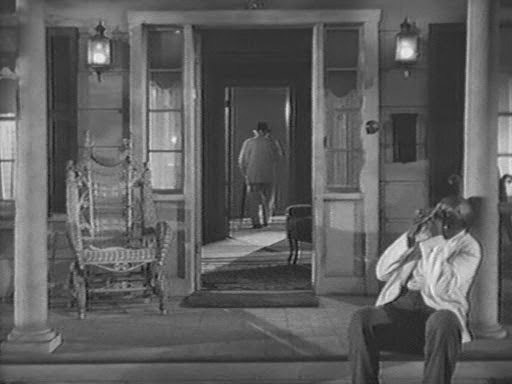 Criterion’s release looks amazing, crisp and clean with a rich gray scale. The 103-minute pre-release version is an HD master which has not gone through the same digital restoration and shows scratches and grit but otherwise looks mighty fine in its own right. Criterion has packed this edition with supplements. New to this release is informed and informative commentary by John Ford biographer Joseph McBride (who provides historical and production background as well as critical observations), the 19-minute video essay “Lost and Gone Forever” by Ford scholar Tag Gallagher (one of the best practitioners of this relatively new form of critical analysis), and a new interview with western historian Andrew C. Isenberg about the real Wyatt Earp. 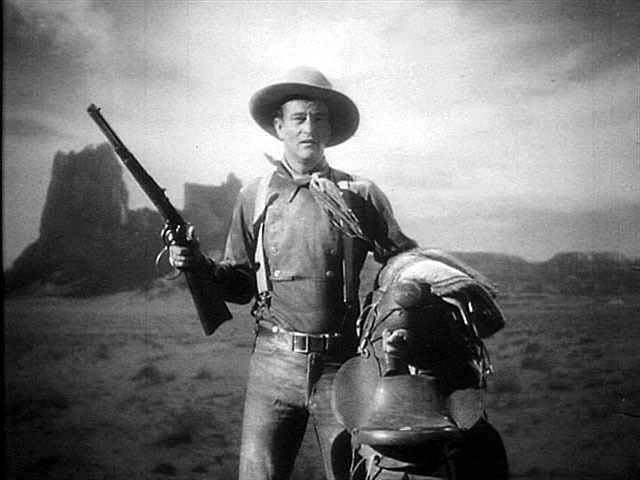 Carried over from the Fox DVD is the 40-minute documentary “What Is the John Ford Cut?” with UCLA archivist Robert Gitt, comparing the versions, commenting of the differences, and filling in the gap with production details and studio records. First among the collection of archival supplements is the 1916 silent western short A Bandit’s Wager, directed by Francis Ford (his brother) and starring John and Francis. This is not a restoration and shows a lot of wear and tear but this transfer is stable and shows great detail, and it features a bright piano score by Donald Sosin. 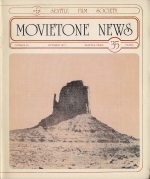 Also features excerpts from the TV programs David Brinkley Journal (on Tombstone, from 1963) and Today (on Monument Valley, from 1975), the Lux Radio Theatre adaptation of the film from 1947 starring Henry Fonda and Cathy Downs, and a fold-out leaflet with an essay by critic David Jenkins. The biggest film history news of 2010 was without a doubt the discovery of Upstream (1927), a John Ford comedy from the late silent era previously thought lost, found in a New Zealand film archive along with numerous other American shorts, features and fragments. After screenings in Los Angeles, Pordenone, New York and elsewhere, San Francisco Silent Film Festival kicked off with Upstream as their opening night event, accompanied by The Donald Sosin Ensemble (pianist and composer Sosin on piano with a makeshift group consisting of members of the Mont Alto Motion Picture Orchestra and others) playing a score that he premiered at Pordenone. Upstream is a lighthearted comedy set in the society of theater and show people in the lower rungs of entertainment, centered on the romantic triangle of a specialty act trio. Eric Brashingham (Earle Fox) is the black sheep of the acting dynasty, reduced to performing with knife thrower Jack (Grant Withers), a brash everyman sweet on the third member Gertie (Nancy Nash, cutting quite the modern girl), who loves Eric. Clearly his only contribution to the act is his name. The Brashingham family name might well have been Barrymore, for all the talk of theater royalty and all the profile posing for photographers and audiences. It’s said that he was disowned by his family because of his lack of talent. It’s more likely it was simply because he’s a jerk, something that Gertie seems willing to overlook. Even when he, of all people in the house, gets the opportunity of lifetime by virtue simply of his family name and jumps ship without a thought for anyone else. It’s not the kind of film we usually associate with Ford but then Ford was a studio man who took on all sorts of films that we don’t necessarily think of as “Ford” films until we see them. This gentle comedy set in the community of show people in a theatrical boarding house was surely just another assignment but Ford makes it a Ford picture through his affectionate characterizations, good natured competiveness and joshing and comic sensibility. This sense of community, the show people as an extended family, is where his touch is apparent, at least in retrospect. Ford is already a master of storytelling shorthand when it comes to introducing a very large ensemble cast of boarders. Those first impressions are very much types but the interaction of the ensemble suggests family, even if it not by blood. The San Francisco Silent Film Festival, the biggest and most well-curated silent film festival in the United States, celebrates its 15th edition by adding a day of screenings, opening Thursday, July 15 with a screening of John Ford’s The Iron Horse (from Dennis James’ personal 35mm print) and then launching into the weekend with the Friday evening screenings of Rotaie (1929), a late silent from Italy, and the newly restored Metropolis (1927), in a digital presentation with accompaniment by the Alloy Orchestra, all at the historic Castro Theatre (in this case, historic also mean no air conditioning, so attendees are dressing in layers and watching the weather). I won’t launch into a big previewâ€”that’s been ably done by Michael Hawley at The Evening Class, Hell on Frisco Bay and Anne Hockens on SIFFBlog (with links to short previews of the individual films by David Jeffers), while Michael Guillen anticipates the restored Metropolis and reprints an essay on the restoration by Bret Wood on The Evening Class. 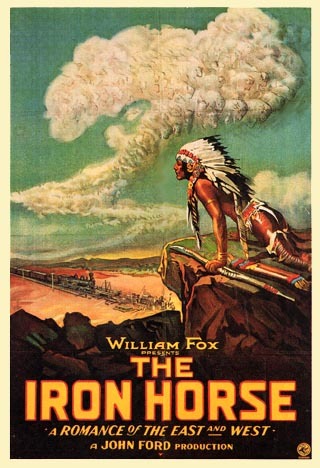 I’ll be dedicating my coverage to reviews and ruminations, starting with The Iron Horse, which launched the festival on its new Thursday opening night. Martin Pawley has barged into Charlie McCorry’s wedding to Martin’s childhood sweetheart Laurie Jorgenson, and the two have waded into a typically Fordian brawl—momentary comic relief from the darker concerns of most of The Searchers. Suddenly, Charlie interrupts the fistfight: “Somebody’s fiddle!” he cautions, picking up an overlooked musical instrument and handing it hastily out of harm’s way before Martin lands the next blow. It’s not the only, but probably the most audacious, announcement of the almost-sacred importance of music to this world and this film. We’ve known it from the outset. In barely two minutes of film time, before the first word of the film is spoken, four pieces of music are thrown at us, each one dramatically distinct and loaded with information. First, we hear what analysts have dubbed the “Comanches” theme, a powerful, full-voiced fanfare that evokes the traditional “Indian” music convention of the western film score, and startles us by supplanting the production company logo music that we’d normally expect in a studio film made in 1956.